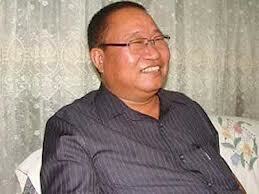 Aizawl, May 20 : The lone Rajya Sabha member from Mizoram Lalhming Liana on Saturday reiterated the demand of his Mizo National Front (MNF) party that a judicial inquiry and not a magisterial inquiry should be constituted to probe the collapse of a government building on May 11 which killed 17 people in northern Aizawl. Lalhming Liana said that the disaster was not a natural one, but a 'government-made' disaster as loss of valuable lives could be avoided if the state public works department (PWD) acted on time and dismantle the office building vacated almost for a year. The PWD office building swept nine houses killing 17 people and the state government was responsible, he said, adding that a judicial inquiry should be ordered for an impartial and fact finding inquiry. He also slammed the Congress government led by chief Minister Lal Thanhawla and also the Congress-led UPA government at the Centre for allocating only Rs 2,278.59 crore as the state annual plan outlay. "While the Planning Commission fixed Rs 2,500 crore for the state annual plan for the current fiscal, inclusion of Rs 221.41 crore under North Eastern Council (NEC) and Non-Lapsable Central Pool of Resources (NLCPR), which were earlier allocated over and above the state plan outlay in the yesteryears indicated as the plan size was smaller than that of 2012-13 which was Rs 2,300 crore," he said.